We have two kinds of coconut, the young ones (kelapa muda) and the old one (kelapa parut). The young ones are green, soft and very delicious especially with warm weather. They are really tasty to make some drinks and dessert. You can make some dessert like Es kelapa (young one with shaved ice), Es campur (blend of different fruits with shaved ice) or Es teler, avocado with jack fruit and condensed milk and shaved ice of course, very delicious. The old one is dry and dark brown color mostly used for dishes such as Rendang. You have to grate it to make santan. But in Europe you can buy in dried form ; it’s easier than grated it by yourself and spare time. By the way I haven’t seen fresh coconut in Europe. So you have to buy dried form. But that’s ok, it doesn’t really matter. You just need to add really hot water in the dried grated coconut to make it soft to make santan. Or the most easiest way and if you don’t really have time to make santan, use santan from can, easy to use. Just add some water to make it thin santan. Quarter it to make it easier for you to grate it. To make santan you generally grate it in an up and down motion holding it with the convex side facing out. The gratings will be fine and result in more santan. After it's grated add ¼ cup of warm water. 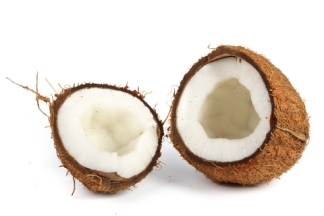 Squeeze handfuls of the grated coconut so that the water becomes white and takes up the juices of the nut. Go on doing this until every last of the grated coconut has gone into the water. Strain the liquid through a fine sieve. The first pressing is called thick santan. Add another ½ cup of warm water after the first pressing to the grated coconut. Repeat the procedure above. This is called thin santan. Continue adding warm water and squeezing and sieving until you have obtained the amount you need. Thick santan is cooked in different manner from thin santan. In santan-based dishes such as gulai or curried, thick santan is added towards the end to minimize the danger of the santan separating. Don’t forget to stir occasionally when cooking santan-based dishes, especially after adding the thick santan. If you don’t, the santan sauce will separate.